The photo above is about as close as I will get to the view I experience coming over the bridge and entering Corpus Christi. That's because I think the photo above was actually taken about 1984 rather than the 1987 estimated by the photographer. The present-day Omni Hotel (the first large building along Shoreline Drive, on the left, nearest the marina) still looks to be under construction; it opened on Valentines Day, 1985, as the Hershey Hotel. The Holiday Inn just behind it also opened in 1985, and appears to have a construction crane on it in this photograph. However, there is no sign yet of the twice-as-tall One Shoreline Plaza between them, which was begun in 1983 but not finished until 1988. The Harbor Bridge has an interesting history. 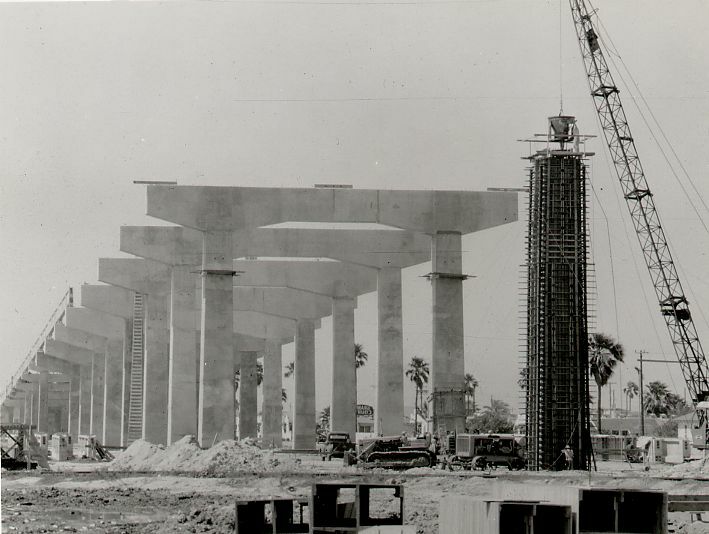 Besides the Texas Department of Transportation archives photos below, a number of 1950s construction photos are available in the William H. Parker Photograph Collection at the Mary and Jeff Bell Library at Texas A&M University - Corpus Christi. 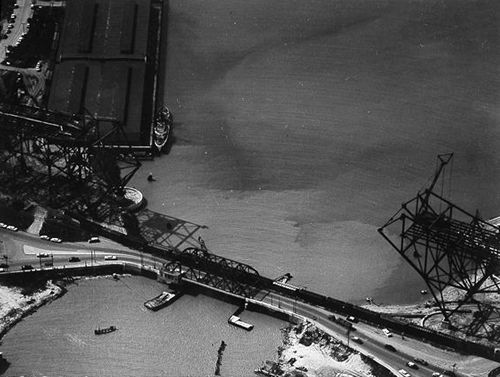 The Harbor Bridge replaced the 1926 bascule bridge (a drawbridge), visible in the two photographs below. Its 97-foot width was a tight squeeze for cargo ships entering the port, and as traffic at both the port and on the road increased, so did delays. My kinsman, city Mayor A. Albert Lichtenstein, was a big supporter of a toll tunnel under the channel, but the City Council, on March 24, 1954, voted to go for a high bridge instead -- mainly because the state highway department would pay for it. 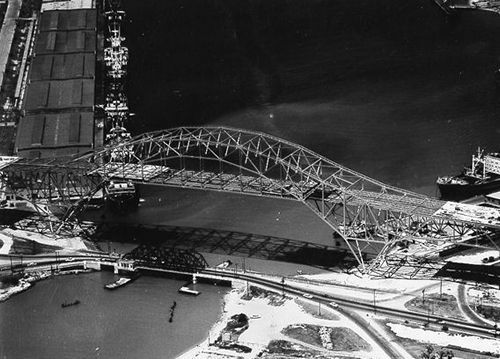 Construction of the Harbor Bridge was started on each side of the ship channel with the cantilever trusses meeting in the middle. When the two spans met they were off by a few inches, which had been expected. One side was jacked up until the two spans fell into line. The new bridge dwarfed the bascule bridge under it. 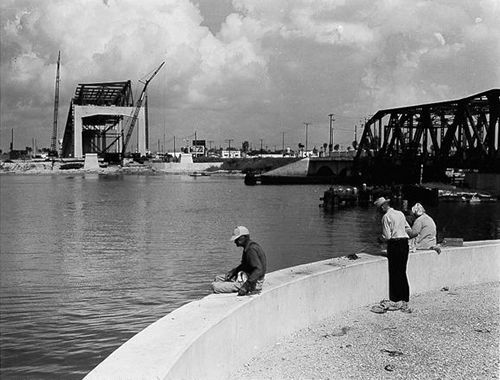 Harbor Bridge opened to traffic on Oct. 23, 1959. The first bridge lights were put up in 1986 by the Central Business District Association, a predecessor to the Downtown Management District. The lights were turned off in February 1998 after numerous circuit failures and corrosion damaged a quarter of the lights. A public-private partnership between the Texas Department of Transportation, the city of Corpus Christi, the Port of Corpus Christi Authority and American Bank helped relight the bridge...in December 2011....in a synchronized array of colors and patterns. 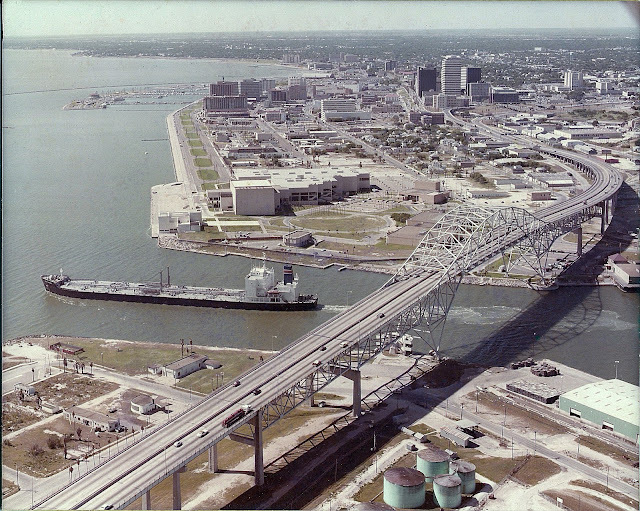 Since then, the bridge has been featured as the focal point for a Corpus Christi Symphony Orchestra concert, that featured a musically coordinated light show, and during the annual Fourth of July fireworks display. The $2-plus million, 11,000-LED lighting system can be programmed to create color changes and patterns in 950+ fixtures to commemorate various events. It's a popular backdrop for portraits. On August 8, 2016, ground was broken for a new Harbor Bridge. The primary reason is safety, as the new bridge's approaches will be straighter, but it will also allow for taller ships (such as cruise ships) to use the port. The current Harbor Bridge has a 138-foot clearance, the new bridge will have a minimum 205-foot clearance. The project is expected to cost a billion dollars and take four years.